Limited Spaces Available! For reservations call 888-557 3330. Spaces are extremely limited this time of year so book early to ensure the date you want. Our Discover Scuba program gives participants the chance to dive deep below the surface of the Sea of Cortez to view the captivating undersea world near Cabo San Lucas. You can enjoy the remarkable underwater environs off the shores of the Baja Peninsula without the time and money investment involved with a scuba certification course. Discover Scuba gives participants the opportunity to try scuba diving without fully committing to an extensive and expensive process. If you love scuba diving after our Discover Scuba Course (and we think you will), you can then make arrangements to begin a PADI certification on your own schedule and at your own pace rather than rushing through on your vacation. The Eagle Divers Discover Scuba Course begins with a half hour video explaining the essentials of scuba diving. After the film, one of our PADI-certified instructors will give a brief oral presentation. 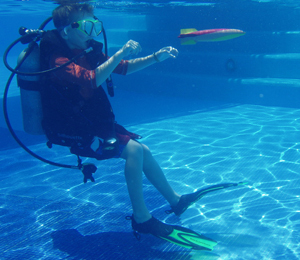 You'll then have the opportunity to become familiar with the scuba equipment before hitting the water. You'll first become comfortable with the scuba gear tin shallow water before heading offshore to explore depths of twenty to forty feet. Cabo San Lucas is obviously a beautiful coastal paradise, with gorgeous stretches of white sand, secluded coves, and charming avenues. If you think that Los Cabos is stunning, just wait until you see the beauty below the surface of the Sea of Cortez. There are extensive coral reefs and hundreds of unusual aquatic species underneath the surface of the water. Our English-speaking instructors will ensure that you have a safe and enjoyable day in the sea of Cortez. All that is required from you is enthusiasm and a love of the water. Q: Can my certified diving partner dive along with me on this course? A: Yes, certified divers can book the Coastal Corridor Dive in order to dive together. These set ups are required to be booked over the phone in order to make the trip together. Cabo Scuba Dive is always interested in your tour experience with us. We hope you enjoyed your tour and love to hear comments. I have been to the Bahamas many times, but Dive-in-a-Day Discover Scuba Course is one of my favorite trips! It includes everything that everyone should do here. As a Bahamas veteran, I can say only the best about this experience!